3,300 mile Mountain Bike Ride down the Continental Divide. . .? Taken September 2018! Hear all about it at the H. Dutcher Community Room at the Saratoga Springs Public Library. 2:00 PM Monday March 25th, 2019 You don’t have to DO it, but you can still participate! Truck Safety: All that you wanted to know, but were afraid to ask! https://vimeo.com/263377367?ref=fb-share&fbclid=IwAR21Qvv6mvTxFoqHANCFOQ6WWPI6apQLeWBiruJQ6CjLIb8Lojstfxenb7Q Just a brief (2:09 minutes) video on Truck Safety! 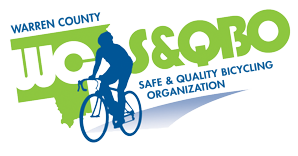 It’s “Common Sense”, but. . . . And after all, we ARE Warren County Safe & Quality Bicycling Organization! At YOUR service!